Flying saucers are excellent for hours of fun on the hill! They glide smoothly across the snow whether it's a child or adult rider! The three-pack of sleds comes in an assortment of appealing colors: orange, lime green and blue! They are made of heavy gauge injection molded high density polyethylene for durability. The saucers have molded hand grips to hold on tight. This is one of our top sellers! Recommended for ages 4 years old and up. Flying saucers are excellent for hours of fun on the hill! Three-pack comes in orange, lime green and blue! Made of heavy duty plastic. Molded hand grips. This is a great sled for beginners! It has a three layer construction; polyester top which displays bright colors and provide a tough topside to the sled. The foam core is super soft and can make the ride down the hill that more enjoyable. Lastly, a super slick Poly Ethylene bottom allows the sled to glide across packed surfaces. It is super light so even the youngest of sliders can carry it back up the top of the hill. The handles are box stitched so the rider can hold on tight as they spin their way down the hill. For children 3- 8 years old, one rider. There is nothing more exciting than to spin wildly down the hill. Hold on tight; the foam grip handles are soft but sturdy. This fun saucer slides well on packed snow. It’s super slick bottom will not crack under cold weather. Built for one rider 5 years old and up. You will love the cushioned ride down the hill on the PE Foam. Cool new design and lightweight. 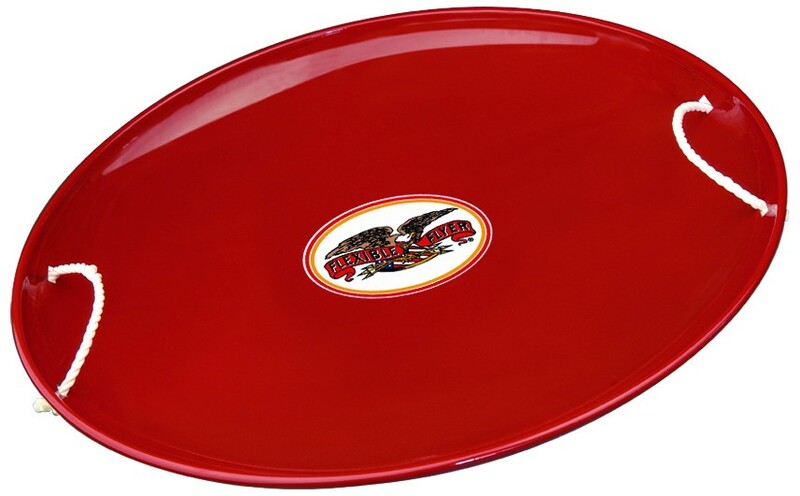 Get outdoors for hours of non-stop fun in the snow with our Fun Disc! It is made of high-density polyethylene which is durable and perfect for an active day on the hill. Our round disc has molded-in hand grips to allow the rider to hold on tight. It glides smoothly across the snow, making it a blast for ages 4 years old and up. This is a fun, low-cost sled and it is made in the USA! Very affordable round plastic sled!